Cronuts are so yesterday. 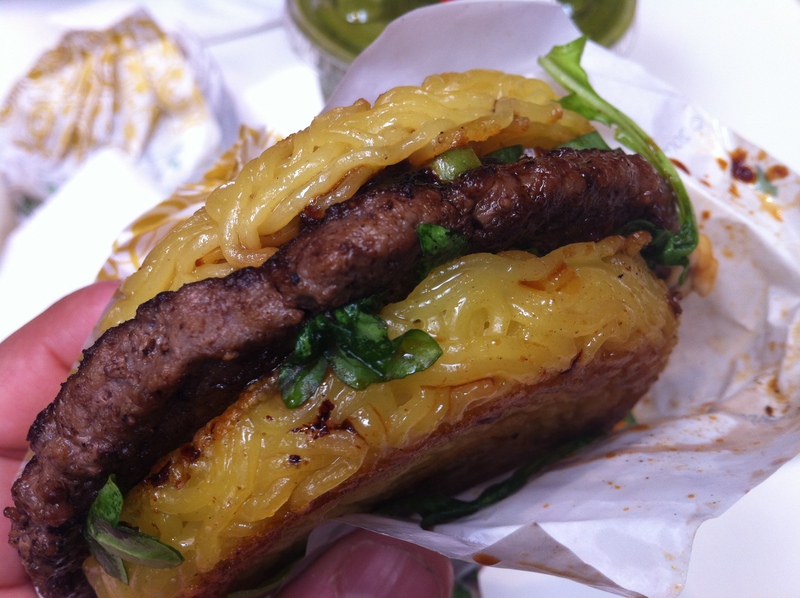 Ramen Burger is the newest buzz in the culinary world. When I first heard that a mystery food called ramen burger was introduced in NYC — sandwiching hamburger patty between two “buns” made out of ramen noodles — I wasn’t really sure how that would work. Sure, the idea is noble – why not marry two of people’s favorite comfort foods for the ultimate East meets West deliciousness? But in practice? I wasn’t too sure. Then, I experienced the original Ramen Burger made by creator and true Ramen fanatic, Keizo Shimamoto, and I finally knew what the buzz was all about! I’ve been following Keizo’s ramen journey through his blog, Go Ramen, for many years. Although I’m not a ramen fanatic myself, I love reading about his passion for the Japanese noodle dish. In 2009, he quit his job and moved to Tokyo to work for a ramen shop across the ocean. I think many of us dream about quitting our day job to pursue our dreams, but he’s one of the few that actually had the courage to do it. The Original Ramen Burger came to Mitsuwa Marketplace in Torrance a few weeks ago to serve up 500 of its now famous burgers to the So Cal food lovers. The last time they were here, the line wrapped around the entire building (check out the craziness here), so we were a bit scared what would happen this time around. Kevin, Pon Pon and I arrived at Mitsuwa around 10:00 a.m. to get our wrist band (Pon Pon got one too so we can have the extra burger ). Luckily, the line was still very short, with about five people deep, although it got really long in the next 30 minutes. The line moved pretty quickly, thanks to the kitchen’s efficiency. So, the flavor – delicious. Absolutely delicious! The burger was more like a deconstructed ramen, as opposed to a fusion burger. When you bite into it, the noodle, which is perfectly cooked at al dente, falls apart nicely in your mouth, creating the illusion that you just slurped a good bowl of ramen. The beef patty adds a nice volume to the spicy arugula and crunchy scallion. But the real hero here is the sauce. I was expecting a teriyaki-like sweet flavor, but this tastes just like the perfectly salty, umami-packed, condensed version of a shoyu ramen broth. When you close your eyes, you’d think you’re eating a real bowl of ramen. Aaah, I salivate just thinking about it. I think there are lots of ramen burger knockoffs everywhere now. I don’t blame people for wanting to imitate Keizo’s creation because it’s so money, but I hope you get to experience the original version. You can really taste his love and passion for ramen in this little, heavenly morsel. For more ramen goodness, check out his documentary, Ramen Dreams. While you watch this, please help me answer the question that I’ve never been able to decipher: How can someone who eats so much ramen stay so slender? I’m jealous. Ha! I discovered your blog (and have been reading it for years) because it is linked off of Goramen.com! I sadly haven’t been able to taste Keizo’s Ramen Burger, but I have had the honor of slurping a bowl with him. Hi Michael! That’s so cool that you got to slurp a bowl of ramen with Keizo! Are you a ramen lover too? Where did you guys go? Now that it’s getting colder outside, I’ve been craving a warm bowl more and more! I hope you get to try the ramen burger soon! Thanks for reading the blog and your support! I love the food blog community! Have a wonderful holidays, Michael!